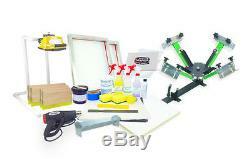 Screen Printing Basic Starter Kit. 2 20x24 Aluminum Screens with 110 mesh. 2- 12 inch & 2- 8 inch squeegees with a 4 place squeegee rack. 2 Pints of plastisol ink black & white. 1 Ink scoop and 1 Ink stirrer. 4oz of pallet / platen liquid adhesive. More eco-friendly than traditional spray adhesives, and last much longer! Exposure unit / stand- 500 Watt Halogen Light. You will need to provide a small sheet of glass with this exposure unit. This can usually be easily found in a picture frame, or at your local hardware store. 1 Pint of emulsion (coats 8-12 screens). 3 Chemical resistant spray heads. 1 Roll of screen masking tape. 10 Test print pellons 5 white & 5 black. 10 Inkjet Films 8.5x11. If you would like to add / remove / change any product in your kit, just let us know. Custom kits for your specific printing needs are available. Short, stubby, sturdy legs keep the press secure while mounted, and keep your workspace clear from big bulky legs that come on most presses. Adjustable dual ball bearing registration system makes for consistent, solid and smooth print arm registration. Rock solid print arm mounts that you can count on for rock solid registration! This press uses a very strong magnet to hold the print arm in the "raised" position. SCREEN CLAMP Swivel screen clamp nuts, keeps your screen from moving while locking it in the screen clamp. Multiple points of off contact adjustment, so you can really dial in any printing circumstance. 16X16 Double sided laminate interchangeable white platen. All of our platen brackets are 50 TON PRESS STAMPED to insure a tight fit, that holds your platen exactly where you want it. Durable, chemical resilient, heavy duty, baked on powder coat finish, for years of protection. Accepts standard 20x24 screens or smaller. ASSEMBLY INSTRUCTIONS, HOW TO MOUNT YOUR PLATEN BRACKET INSTRUCTIONS, POINTS OF ADJUSTMENT INSTRUCTIONS. While nearly any other press on the market fails to offer upgrade options, this press is an investment that can continue to grow with you and your business. PRINTING STATIONS AND PRINT ARMS. This press is not capable of upgrade micro registration or side clamps. Please check out our Springer SP or Kicker model presses, that offer these upgrade options. This kit requires some light assembly. Detailed assembly instructions are included. If you have any questions, PLEASE FEEL FREE TO ASK! We are always available to help! This kit ships in multiple boxes, which may arrive on different days. This screen printing kit ships for FREE in the Contiguous USA. All items must be new and unused. The item "Silk Screen Printing Press 4 color, heat gun, exposure unit equipment kit setup" is in sale since Wednesday, August 22, 2012. This item is in the category "Business & Industrial\Printing & Graphic Arts\Screen & Specialty Printing\Screen Printing". The seller is "screenprintingandsignsupplies" and is located in Clinton Township, Michigan.